This extraordinarily beautiful and massive castle, which resembles Renaissance French palaces, is an adornment of Örebro, a Swedish city. From a distance, this historic building looks like a gigantic ship reflecting on the water mirror since many centuries ago it was decided to construct it on the island on the Svartån River. 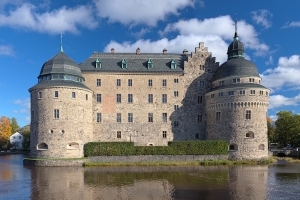 Apart from a picturesque location, the castle can boast an interesting story related to the surnames of different Swedish rulers: from medieval jarls to members of today's royal dynasty of Bernadotte. By the end of the 19th century the fortress was renovated and next open to public as a historic tourist site, which obtained a national monument status after several decades. The mid-13th century is believed to be the date of constructing the castle, despite the fact that detailed data on the origin of the castle did not remain. 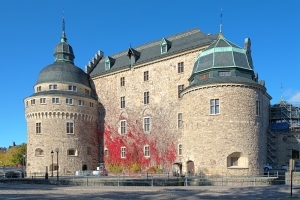 According to the historical records of a local bishop dated from the 18th century, the castle was built at the request of famous Jarl Birger, Sweden's ruler and founder of Stockholm. In that time this building was rather a small defensive structure on the island surrounded by the Svartån River. Furthermore, it contained a massive watchtower. A seven-metre-high wall was erected around it, forming a pentagonal inner courtyard. 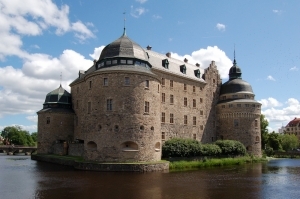 Like any other medieval castle, the Örebro Castle was originally built as a defensive building, especially because several important routes met in that town: trade routes to Dalarna, former pilgrimage routes to Norway, as well as Eriksgat's route which, according to tradition, was covered by newly-elected Swedish rulers to familiarise themselves with their lands. 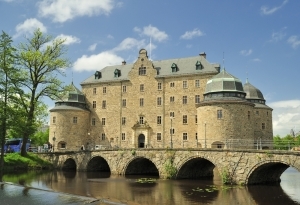 Today the Örebro Castle, which has had an honourable national monument status for many decades, is a very popular tourist site. Not only museum displays and galleries are housed in the spacious fortress but also modern conference rooms, offices, scientific centres, hotels, banquet halls and restaurants arranged in the medieval style. 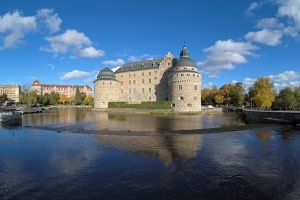 The castle towers with viewing terraces offer tourists wonderful experiences of admiring the panorama of the ancient city of Örebro from a bird’s eye view. Yearly, numerous entertainment events, festivals and fairs take place on the premises. A historic display in the north-west tower takes tourists on a wonderful journey through eras, showing them how everyday life behind the walls of the fortress was like three or four centuries ago, how the castle itself looked like, how particular facilities were used. Here you can see a mock-up presenting the medieval Örebro Castle with adjoining buildings which, unfortunately, did not remain to the present day. Unique programmes specially for the youngest visitors, such as theatrical performances and feasts, were prepared. During those programmes children learn about the long history of the castle as well about their country in an interesting way.